The previous QPSK Simulink exercises assumed perfect synchronization, perfect timing synchronization, or perfect phase synchronization. It is now time to explore how it is in practice--neither carrier phase nor timing is known to the detector and must be estimated. Simultaneous carrier phase and symbol timing synchronization is an example of a joint estimator: more than one unknown parameter is estimated. This is accomplished using two PLLs, one for timing synchronization (the inner loop) and one for carrier phase synchronization (the outer loop). The issue of carrier phase ambiguity is still with us, so differential encoding is also used here. In this exercise, you will design a joint carrier phase and symbol timing timing synchronizer for QPSK based on two PLLs. There are three sample rates in play in this design, so you must be careful in assigning sample times to the Simulink blocks. This project is divided into two parts. In place of a data file, the input to your Simulink demodulator is the output of a Software Defined Radio (SDR) known as the Pluto Radio. The Pluto Radio was developed by Analog Devices and is supported in a big way by the MathWorks. The Pluto Radio is an external radio that connects to your computer via a USB cable. In this lab, a signal is transmitted from one Pluto Radio, and received by a second Pluto radio connected to your computer. The Pluto radio produces I/Q samples (organized into complex-valued numbers) that are processed by your Simulink design. In the first part, you will design and debug your system to operate with samples captured from a Pluto radio output. In the second part, you will replace the input to your Simulink design with a Simulink block that interfaces with the Pluto Radio. M-ary QAM: Section 5.3 (pp. 238 - 260), discrete-time realizations: Section 5.3.2 (pp. 256 - 260), partial response pulse shapes: Section A.2 (pp. 682 - 687), discrete-time PLL: Section C.2 (pp. 732 - 747), carrier phase synchronization for QPSK: Section 7.2 (pp. 365 - 375), differential encoding for phase ambiguity resolution for QPSK: Section 7.7.1 (pp. 402 - 405) general discussion of timing synchronization: Section 8.1 (pp. 436 - 438), discrete-time techniques for symbol timing synchronization for binary PAM: Section 8.4 (pp. 445 - 494), discrete-time techniques for symbol timing synchronization for MQAM: Section 8.5 (pp. 494 - 497). 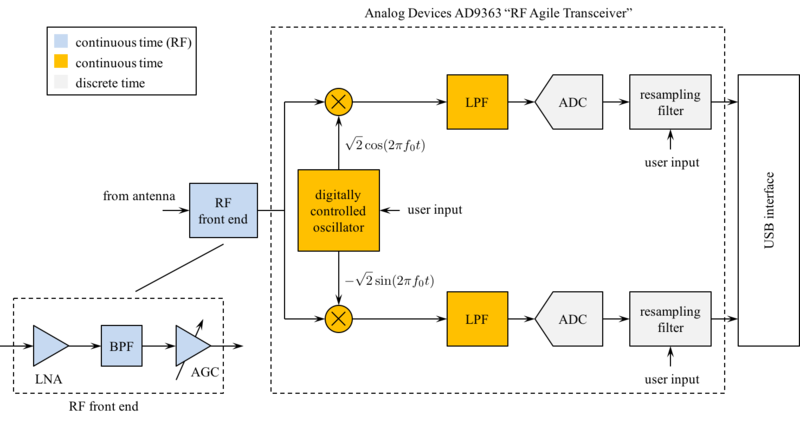 A (very) simplified block diagram the Pluto Radio as a radio receiver is shown below. The Pluto Radio comprises a software configurable RF Front End, I/Q Mixer to perform quadrature down-conversion, and a pair of analog-to-digital converters (ADCs) operating on the filtered quadrature downconverter outputs. The center frequency used by the quadrature downconverter is specified by the user. The desired sample rate for the I/Q samples is obtained from the (high) sample rate signal using resampling filters. [See Section 9.3 (pp. 555-577) of the text.] The desired sample rate is specified by the user --- one usually selects an integer multiple of the symbol rate. The I/Q samples are transferred to your computer via a USB interface and appear in Matlab and Simulink as a vector of complex-valued variables: the real part is the inphase component (I) and the imaginary part is the quadrature component (Q). The gain blocks is used to scale the Pluto Radio output to the desired average energy. This needs to be done only once because the Pluto Radio RF front end is equipped with an Automatic Gain Control (AGC) circuit. [See Section 9.5 (pp. 588-592) of the text.] This scaling is important because the TED and PED gains (both Kp) are proportional to the input signal level. Hints for getting the scaling right. The number of samples/symbol is determined by the sample rate you specify. My experience with the computers in the lab is that a good design can operate at an input sample rate of 160 ksamples/s. This produces N = 160 ksamples/s / 40 ksymbols/s = 4 samples/symbol. Let us use either the early-late TED or the zero-crossing TED. Because both TEDs operate at 2 samples/symbol, the matched filter output must be downsampled by N/2 where N is the number of samples/symbol at the Pluto Radio output. The resulting downsampled sequence is at 2 samples/symbol. The carrier phase synchronization loop is the outer loop shown in red. In the two previous two Simulink exercises devoted to carrier phase synchronization for QPSK (Carrier Phase Synchronization for QPSK Using the Unique Word and Carrier Phase Synchronization for QPSK Using Differential Encoding/Decoding), perfect timing synchronization was assumed and this assumption allowed the carrier phase PLLs to operate at one sample per symbol. In contrast, the matched filter outputs here are at 2 samples/symbol. Consequently, the CCW rotation block operates at 2 samples/symbol. Design the loop filter to create a second order PLL with a closed-loop bandwidth of 1% of the symbol rate and a damping factor of 0.7071. You may need to increase the closed-loop bandwidth depending on the carrier frequency offset you experience. Each radio produces its own frequency offset. The symbol timing PLL is the inner loop shown in blue. Except for the CCW rotation block, the symbol timing PLL is identical to the one you designed for the Symbol Timing Synchronization for QPSK Simulink Exercise. The strobe signal is derived from the decrementing modulo-1 counter. Use the underflow condition in the decrementing mod-1 counter as the strobe signal. You need to create an "enabled" version of the early-late TED or the zero-crossing TED. When the strobe is high, the TED output is given by either equation (8.34) on page 454 (early-late TED) or by equation (8.37) on page 456 (zero-crossing TED). When the strobe is low, the TED output is zero. The subsystem consists of a simple wire with the enable icon above it. This means the wire is only active when the enable signal (strobe in this case) exceeds a predefined threshold (double click on the enable block to set the threshold). When the enable signal (strobe in this case) is below the predefined threshold, nothing happens and the output holds its value. Design the loop filter to create a second order PLL with a closed-loop bandwidth of 1% of the symbol rate and a damping factor of 0.7071. The decision subsystem is also enabled. This is because decisions should be made on every other interpolator output on average. The strobe indicates which interpolator outputs represent the desired signal space projections. Design the detector shown above using blocks from the Simulink, DSP System, and Communications System Toolboxes. Download the file TestInput.mat and place the file in the directory where your Simulink model resides. In the Matlab workspace, type "load TestInput.mat" This loads the variable "r" in the Matlab workspace. Note that "r" is approximately 5 s of captured data from the Pluto Radio receiver at a sample rate of 160 ksamples/s. For this reason, "r" is a 501420 x 1 complex-valued variable. The simulation produces just under 200,000 symbol decisions. The exact number depends on when and how your timing loop locked. Note that this number of symbols corresponds to about 122 occurrences of the PRE and DATA fields. To find the data, look for the 32 bit (16 symbol) PRE pattern in the detector output. You should find it approximately 120 times. Pick one of the occurrences: the following 3206 bit decisions (1603 symbol decisions) correspond to 458 7-bit ASCII characters. Determine the message using your Matlab script. How long did it take for your carrier phase PLL to lock? What is the frequency offset? How long did it take for your symbol timing PLL to lock? What is the clock frequency offset? In prepration for Part 2, we will do something fancy to create a more computationally efficient design. This block performs the same matched-filter-and-downsample operations as your earlier design, but performs this operation in a more computationally efficient manner using a polyphase filterbank [See Section 9.3 (pp. 555-577) of the text]. Confirm the system works the same as the previous system. 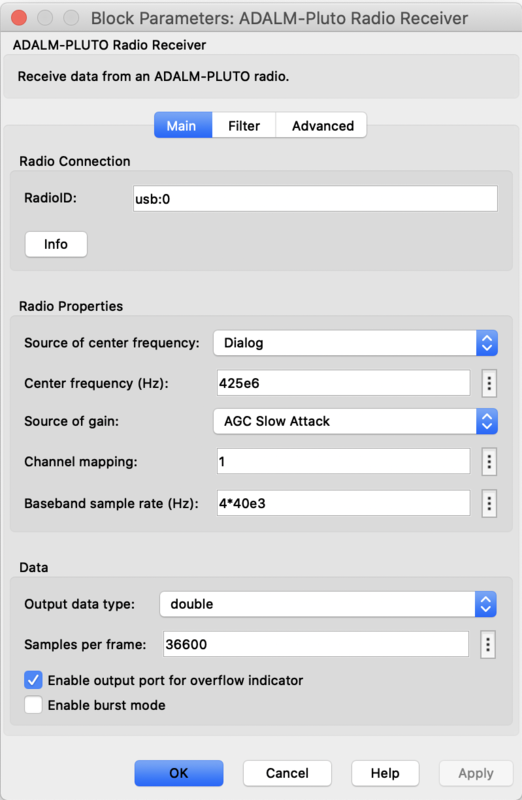 Note that the baseband sample rate (BasebandSampleRate parameter) is set to 4 samples/symbol. 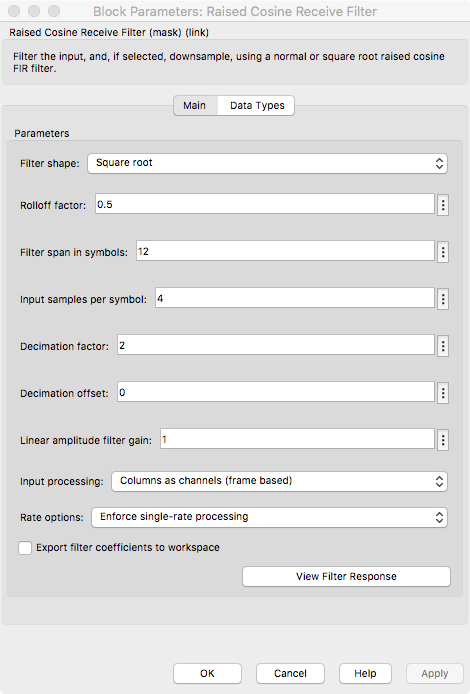 If you change this, you will have to change the downsample rate in the matched filter. The Pluto Radio outputs a "frame" of data each time Simulink "calls" the interface function. This is done to help boost real-time performance. Each function "call" to the Pluto Radio requires a great deal of networking overhead. If, for example, each "call" to the Pluto Radio requested a single sample, the networking overhead would be applied to each sample, and the achievable sample rate would be embarrassingly low. Here, each "call" to the Pluto Radio produces 36600 samples (Simulink calls this a "frame") so that the networking overhead is amortized over the entire frame. The number of samples per symbol and the "decimation factor" (I call it downsample factor) are a function of the input sample rate as described above. The settings shown here assume a sample rate equivalent to 4 samples/symbol from the Pluto radio. The input processing is set to "Columns as channels (frame based)" to maximize efficiency. One could unframe the data at the Pluto radio output and use sample-based processing here. But, because the data is already framed, the system runs faster the way it is shown. Single rate processing is enforced here because frame-based processing is used. The downsample by 2 simply reduces the size of the frame by a factor of 2. The "Unbuffer" block converts frames to a serial stream of samples. This is required at this point because the PLLs are recursive. Following MATLAB's recommendation for best practices, we have waited as long as possible before converting from frame-based processing to sample-based processing. This allows you to monitor the performance of your Simulink system. Connect the Pluto Radio to your computer using the USB cable accompanying the Pluto radio. Your demodulator runs for 5 seconds, which corresponds to 200,000 symbols. If properly designed, your PLLs have plenty of time to lock and you should detect approximately 120 occurrences of the PRE field described above. Scopes and other displays require a lot of computing resources and can slow the speed at which your demodulator operates. Try to use as few scopes as possible. The only "display" I used was the Constellation Diagram block. In my design, I performed differential decoding in Simulink using look-up tables. But you may perform differential encoding in a Matlab script. Whichever approach you take, but sure to use the differentially decoded data to find the secret message(s).